Chinese President Xi Jinping has shared his vision for the BRICS cooperation which he believes will enter a second "golden decade" if the emerging-market countries work together to overcome the challenges of weak growth and threats to world peace. With Russia's Vladimir Putin and India's Narendra Modi joining in, the leaders of the world's five major developing countries will chart way forward for the bloc at the ninth BRICS summit scheduled for Sept. 3-5. He said despite headwinds causing growth setbacks, the BRICS countries are "fully confident" about their growth potential and the future outlook. Xi said three important practices of the shared value should be carried forward -- treating each other as equals, seeking results-oriented cooperation, and bearing in mind the well-being of the world. "Dialogue without confrontation, partnership without alliance," Xi summed up the cooperation principle in a simple phrase. "We should not ignore problems arising from economic globalization or just complain about them. Rather, we should make joint efforts to find solutions," Xi said. "Only openness delivers progress, and only inclusiveness sustains such progress," Xi said. The Chinese president said the development of emerging market and developing countries is not intended to "move the cheese of anyone" but to "make the pie of the global economy bigger." Xi said this "BRICS Plus" approach should be promoted to build an open and diversified network of development partners for the bloc. Turning to China, Xi said the country had made the "right choice" on deepening reform and will march on in strides. "The past decade has not only seen solid progress in the BRICS cooperation; it has also witnessed the unfolding of all-round reform and opening up in China and its rapid economic and social development," Xi told the forum. He said China's economic aggregate grew by 239 percent over the past ten years and the lives of its 1.3 billion-plus people have been significantly improved. "Going forward, China will continue to put into practice the vision of innovative, coordinated, green, open and inclusive development," he said. 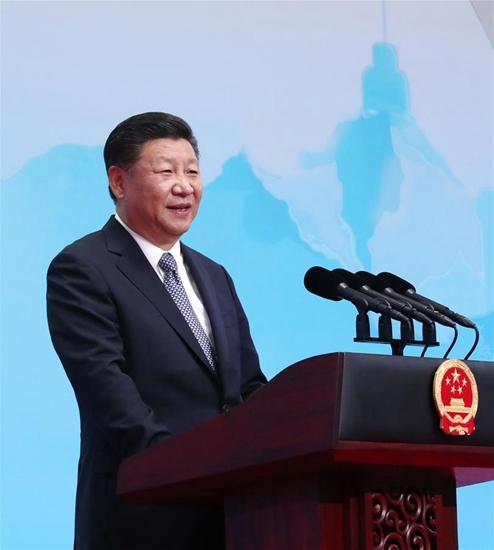 "We will adapt to and steer the new normal of economic development, push forward supply-side structural reform, accelerate the building of a new system for an open economy, drive economic development with innovation, and achieve sustainable development," Xi said. Chinese President Xi Jinping has shared his vision for the BRICS cooperation which he believes will enter a second "golden decade."